Hard times come for all in life, with no real explanation. When we walk through suffering, it has the potential to devastate and destroy, or to be the gateway to gratitude and joy. Elisabeth Elliot was no stranger to suffering. Her first husband, Jim, was murdered by the Waoroni people in Ecuador moments after he arrived in hopes of sharing the gospel. Her second husband was lost to cancer. Yet, it was in her deepest suffering that she learned the deepest lessons about God. Why doesn't God do something about suffering? He has, He did, He is, and He will. Suffering and love are inexplicably linked, as God's love for His people is evidenced in His sending Jesus to carry our sins, griefs, and sufferings on the cross, sacrificially taking what was not His on Himself so that we would not be required to carry it. He has walked the ultimate path of suffering, and He has won victory on our behalf. This truth led Elisabeth to say, "Whatever is in the cup that God is offering to me, whether it be pain and sorrow and suffering and grief along with the many more joys, I'm willing to take it because I trust Him." Because suffering is never for nothing. 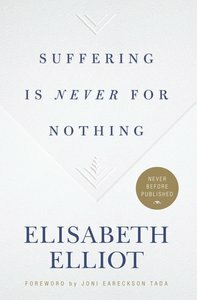 About "Suffering is Never For Nothing"